Antonio di Manfredo da Bologna, known as Antonio Pirri, was a Bolognese painter about whom little is known. The only surviving information to date is that he was in Naples in 1511. Venturi and Longhi both, however, included him in their texts on Italian art and he was the subject of individual studies by Bargellesi in 1953 and Martini in 1961. His oeuvre includes various signed works: two in the Museo Poldi Pezzoli in Milan and another in a private collection depicting Saint Paul and Saint Anthony the Hermits. On the basis of these three oil paintings various other works have been assigned to Pirri, almost all in private collections. Among the most notable characteristics of this painter, who seems to have worked in the first half of the 16th century, is the early influence of Francesco Zaganelli, followed by a second, more classicising phase influenced by the Ferrarese artists Francesco Francia and Lorenzo Costa. The present canvas, formerly on the Italian art market, was acquired in 1977 already attributed to Pirri. A year before in 1976, Mina Gregori dated it to the second half of the 1520s and drew attention to the landscape in the background with its range of blue and earth tones suggestive of Venetian influence. Saint Francis receiving the stigmata was a popular episode in the life of this saint, born in Assisi in 1182. Son of a merchant, Francis abandoned the comforts of life provided by his family’s wealth and founded one of the largest mendicant orders. He was canonised in 1228, two years after his death, and his biography was written by Tomás de Celano. The saint died in the monastery at Porciuncula, near Assisi, where he lived with his followers. Francis received the stigmata in 1224 on Mount Albernia, where he had retired and where he had a vision recounted by Tomás de Celano. On the mountainside Francis saw Christ inside a six-winged cross floating in the air. At that moment Christ’s wounds appeared on Francis’ side, hands and feet. Pirri depicts the moment when Christ’s wounds emit narrow beams of light that imprint themselves on the saint’s body, producing little beams that indicate their location. Francis, kneeling, looks impassively at the cross. The setting for this miracle is constructed from a series of rocky outcrops and hills between which an idyllic river guides our gaze into the background, which has a city and mountains. 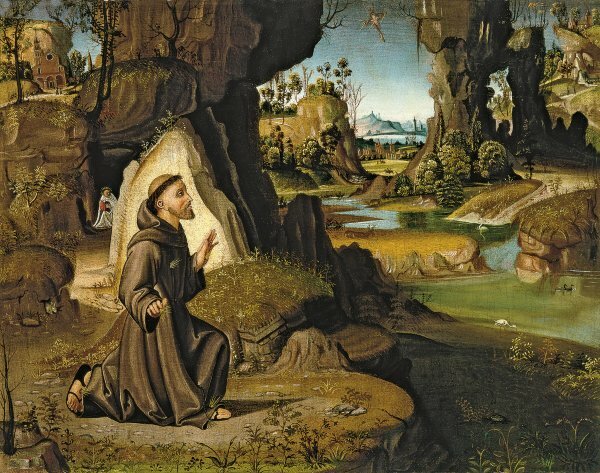 The foreground of this wild, rocky setting has small animals such as rabbits, ducks, swans, storks, deer, a tortoise by the river and a snake that approaches the saint, reminding us of Francis’ great gift with animals, who became tame in his presence.